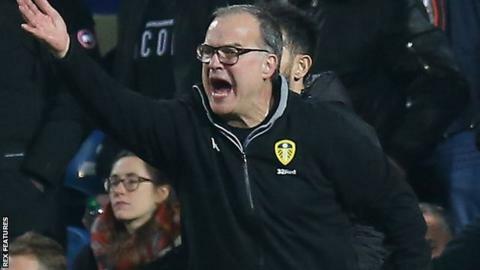 Leeds United manager Marcelo Bielsa says his side will not drop off the pace in the fight to win promotion from the Championship. United were beaten 1-0 at QPR on Tuesday - a side who had lost their last seven league matches - to suffer their fifth defeat in 10 games. Bielsa's side had lost just three league games prior to the current run. "What our team has shown in every game is that we have an excess of energy," he said after the defeat. Leeds have dropped from the top of the Championship to third place - two points off leaders Norwich City - after they had a three-point lead at the top on Boxing Day. They would have returned to the summit of the second tier had they beaten Rangers. Bielsa's reputation for playing a pressing game had led to concerns that his side could run out of steam. Leeds fans saw the club start last season well before results tailed off and Thomas Christiansen was sacked 12 months ago. "If you look at the figures you can see that if there is a problem that this team has, it is not a lack of energy," Bielsa added. "It's not an opinion, you just have to look at the figures to draw your own conclusions."